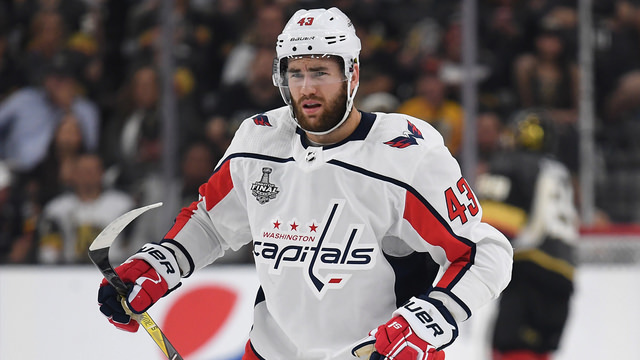 Tom Wilson suspended 20 games for pre-season hit, Report. During the Washington Capitals’ final preseason game against the St Louis Blues, Tom Wilson delivered a high head hit to forward Oskar Sundkvist. Wilson received a match penalty and was ejected from the game. Sunday night, following the game, the NHL’s Department of Player Safety announced that Wilson had been offered an in-person hearing for the hit. The offer allowed Player Safety to suspend Wilson for six games or more. That meeting took place on Wednesday morning, at the NHL’s New York Offices. Wilson has been suspended for 20 games. The suspension marks Wilson’s fourth in the last two seasons. Wilson was suspended twice during the 2017-18 preseason, both against forwards on the St. Louis Blues. He was suspended again during the 2018 Stanley Cup playoffs for a head hit on Pittsburgh Penguins forward Zach Aston-Reese. According to the league, this is a surprisingly high number of suspensions.